Welcome to the Happy Little Paintings Blog! My painting career began when I walked into a Hobby Lobby store one October day in 2004. There, right in the lobby, was an easel holding a beautiful, framed oil painting with a sign underneath advertising painting classes taught by Bob Ross Certified Instructor® Joyce Meffert. I took one of the registration cards home with me. On a whim, I called the number on the card and was advised that the class was full. I requested my name be put on the waiting list, and I just thought that was the end of that. Later on, Joyce called me and said there had been a cancellation and asked if I was still interested. Of course I was! So I was off to my very first painting class. I was late to class and had to sit in the back. I had never touched a paint brush to canvas before in my life, and I was terrified. But Joyce was patient and encouraging to me and the other "newbies". By the end of the class, we were all amazed with our results. I kept this painting a secret until I gave it to my husband for Christmas. He couldn't believe I painted it! 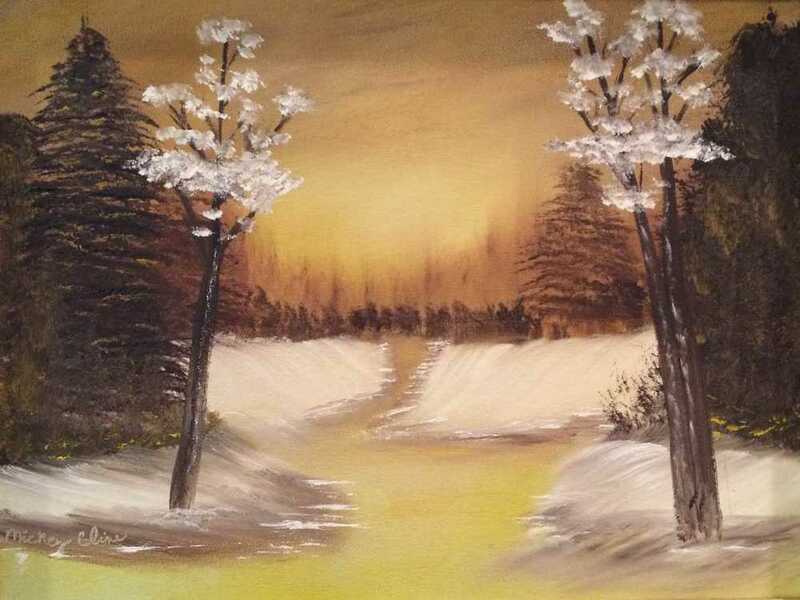 That same Christmas, my son gave me a Bob Ross Master Kit, and I began painting at home. I took classes from Joyce over a period of 11 years. She encouraged me to study for my certification to teach, and I finally did. I earned my certification on Sept. 18, 2015, at the Bob Ross Workshop in New Smyrna Beach, Florida. Needless to say, I did improve over the years and am still eagerly learning new techniques. It is such a joy to show others that they, too, can create beautiful paintings using the Bob Ross technique! This method of painting may not be for everyone, but for many, it's a fun and relaxing way to spend some time and scratch that creative itch. I hope you will join me in a class soon and experience your own Happy Little Painting!